Backyard picture updated every now and then. Sorry for the quality, but it's a cheap camera. "Bru" Helmboldt has been birding (semi)seriously since 1982, when he stumbled on the Whitefish Point Bird Observatory (WPBO) near Paradise (really!) 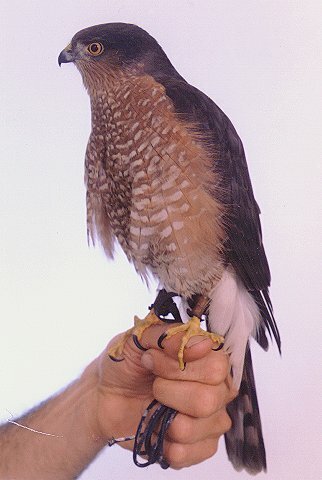 in Michigan's upper peninsula, and observed over 2,000 Broad-winged Hawks and 1,000 Common Loons in one 24-hour period. His life-list now totals 462 species of birds. These include many which he has banded as a volunteer at WPBO (a major bird migration choke-point on Lake Superior near Sault Ste. Marie) and the Rocky Mountain Bird Observatory (RMBO) (which used to be the Colorado Bird Observatory), a newer bird study site on Barr Lake northeast of Denver. His birding highlight is probably the one day, MAY 8th, 1990, that he teamed in banding 192 Sharp-shinned Hawks (Sharpies) at WPBO. Bru's first wife, Wendy, wasn't much for going out in the woods (or anywhere else, for that matter) and watching birds, but she soon departed for greener pastures anyway. When Bru met his second wife, Melanie, in 1990, she had only a mild interest in feathered critters, but she rapidly compiled a life-list of 390 species. Her favorite birds were raptors (hawks and owls) and her birding highlight was her first Bald Eagle in flight. In recent years, Bru has birded the Great Salt Lake basin and Utah mountains, the Grand Canyon (north and south rims), Zion N.P., Bryce N.P., and Cedar Breaks N.P., having lived in Salt Lake City for three years, and he began exploring the Pacific northwest and Puget Sound area after moving to Duvall, Washington, east of Seattle, in 1994. His recent birding vacations included return trips to WPBO, a second expedition to birder's Mecca, Southeast Arizona, (especially Patagonia / Sonoita Creek and Madera Canyon), a rather disappointing pelagic trip out of Monterey, California, and a Lindblad/National Geographic expedition to southeast Alaska. Local excursions included two pelagic trips on the Johnstone Straits (northeast coast of Vancouver Island), camping near Tofino on Vancouver Island, British Columbia, (did you know that a Steller's Jay can hold 15! Cheerios in it's beak, storage pouch, and crop at one time? ), and the Vancouver city area of B. C., Canada, the San Juan Islands in Puget Sound, and the Newport area of the Oregon coast. Bru participated in a "big day" in early May, 1996, which resulted in 103 bird species counted within King County, Washington, in one day. On Saturday, December 13th, 1997, Bruce chalked up his first FOUR falcon day - American Kestrel (four of 'em), Merlin (a dozen! ), Peregrine Falcon (two), and Gyrfalcon (one), all on the Samish Flats and Skagit Flats in northwestern Washington. 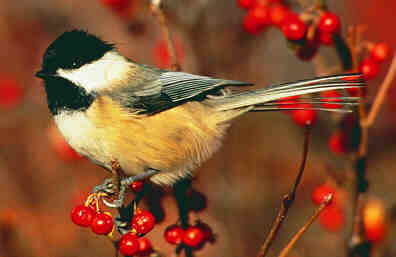 A favorite winter visitor - a Black-Capped Chickadee - the United States Marine of the bird world. That's his call you hear if your speakers are on. 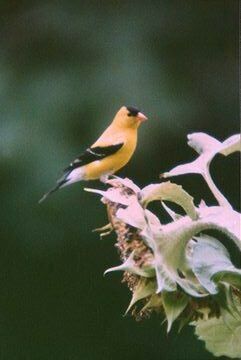 Bru's only "claim-to-fame" in Washington state is a King County, WA, "first record" LESSER GOLDFINCH at the Duvall "Helmboldt homestead", first spotted on June 28th, 1997. 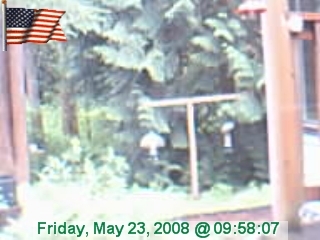 That bird was written up for the Washington Bird Record Committee, since it was far north of it's normal range, and accepted about ten years later as official. I understand that it's still a lone report in King county - nobody else has ever recorded one this far north - ever - yet. In April, 1999, Melanie broke her marriage vows and ran off (with her son and both cats) to Denver. Her divorce filing (her third) was finally granted on July 7th, 2000. Good riddance. 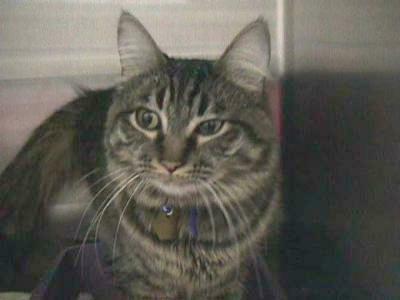 Bru remained (with his new cat - Killick) in Duvall, sadder but wiser, until he discovered a new love, Dana, in the autumn of 2001, shortly before his retirement. Bru now lives with her near Redmond, WA, and continues to acquaint her with all of the wildlife in her beautiful near-acre woodlot. Regular visitors include families of black-tailed deer, raccoons, a Snowshoe Hare, a coyote, a bobcat, the neighborhood Cooper's Hawk, a pair of noisy Northern Ravens, and a Pileated Woodpecker family, along with the usual LBJs (little brown jobs), and even some bats. Squirrel feeders are also a necessity here, to keep them (Eastern Grey Squirrel, Western Red Squirrel, and Chickaree) out of the birdseed. Many come for the water at our new cascade, rill, and pond, including up to 40 mallards. Bruce's latest "lifer" was a Kittlitz's Murrelet, added on 15 MAY 2008, in Glacier Bay National Park, Alaska, on the SE Alaska expedition. Bru's favorite "web" birding site is Dan Victor's Tweeters page, an offshoot of a Pacific Northwest mail list on the internet. Lots of good birding stuff here and LOTS of birding links!! For some neat Tweeter's merchandise with a Vaux's Swift logo by Mike Denny, click here. Also check out Mike Patterson's Home Page (good Pacific Northwest info), and Birds, and the ultimate - Bird Links to the World. other items of interest or non-interest are now posted (occasionally) in his blog on Facebook. Look for bru helmboldt there. Another winter guest, especially when the mountain snows get deep. 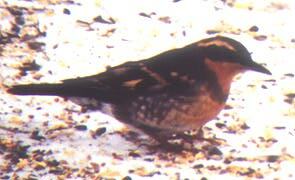 This is a Varied Thrush, Ixoreus naevius. 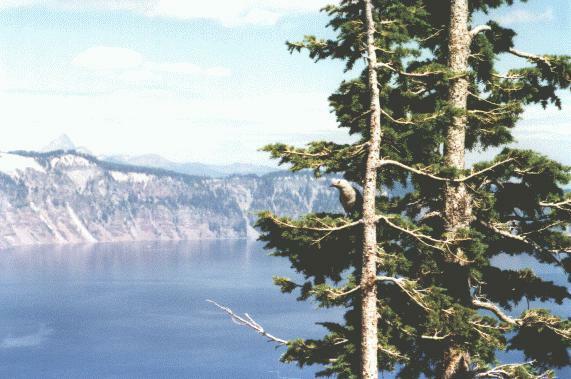 photographed on the rim of Crater Lake, Oregon, in 1996.
and a common visitor to our feeders. 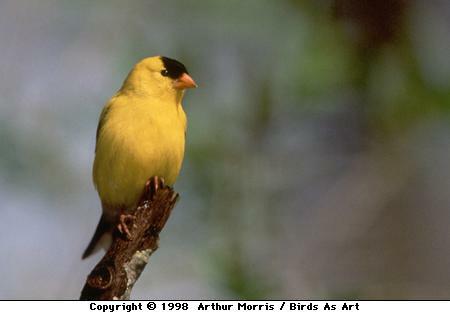 Click here to hear a RealAudio clip of an American Goldfinch - sound clip. 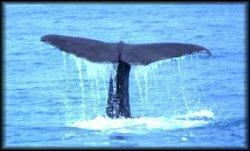 Thanks to Virtual Birder for the pic and sound file! Everything you ever wanted to know about Red Crossbills, even sonograms of the eight different types. And don't forget to check my "Loon Page"! Thanks to Wildbird Magazine for some of the sites in this listing. There are lots more sites out there, so keep searching. Here is a link to Rare Bird Alerts and Internet email groups - BirdMail. Need a checklist? For ANYPLACE? Check here! Optics: Bruce birds with a pair of phase-corrected 10x50 Celestron Rangers from Eagle Optics. His backup bins are Minolta 10x42 Weathermatics (dating from the mid 1980s) that he got at REI, and he also carries a pair of Orion 8x21 minibins in his briefcase for those "business trip birds". Serious long-range viewing is done with a Celestron C-90 spotting scope with a .96" 30x eyepiece, mounted on a Velbon Stratos 450 tripod. Questions on birdfeeding, birdfeed, etc? Read this! 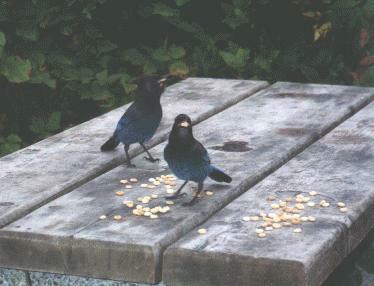 Everything you ever wanted to know about feeding birds. And speaking of birds, here's a really HOT ONE! Many thanks to Ms. Cindy Roberts and Mr. Jeremy Boland for early scanner work!